Since our beginnings in 1958, Watson’s Profiling has produced tens of thousands of complex components and assemblies for a wide variety of industries and applications. Our success with complex precision machining is the result of teamwork, and a company-wide dedication to quality and craftsmanship. The process begins with the seamless integration of your digital product definitions (DPD) into our manufacturing operations using our advanced Catia V5 and Master Cam CAD/CAM systems. Using the principles of lean manufacturing, your job moves through our carefully-planned and monitored manufacturing process with state-of-the-art precision machining technology and vigilant in-process and final inspections. No job ships from Watson’s Profiling unless it is inspected and verified to be 100% compliant with your drawing and contract requirements. In the world of contract manufacturing, successful complex machining is no accident. It requires a team-based effort combined with the wealth of hands-on, precision manufacturing knowledge gained from more than fifty years in the industry. At Watson’s Profiling you’ll find the people, the equipment and the experience you need to deliver your most challenging complex parts and assemblies on-time, every time. Contact Watson’s Profiling for your next complex machining requirement and let us show you what we can do. In the precision manufacturing business, value is measured by a combination of price, quality and delivery; and in today’s competitive marketplace, the successful company must consistently deliver all three. At Watson’s Profiling, our entire organization is built on a rock-solid foundation of quality, value and outstanding customer service. Our business has grown steadily over the years because we keep our promises to our customers, and because we continually invest in the latest manufacturing technology, and in our own people, to make sure that your parts and assemblies are delivered on time, and at the best possible price. Our facility is certified to ISO 9001:2015 and AS9100D, and approved by Boeing to BQMS D6-82479. At Watson’s Profiling, quality and reliability are not just buzzwords; they are our way of life. For more than five decades we have produced mission-critical parts and assemblies for some of the most demanding customers in the world. Put our commitment to exceptional quality and reliability to the test for your next precision machining requirement. Our customers count on Watson’s Profiling to deliver real quality and value every time; and so can you. Throughout the years, Watson’s Profiling has been recognized by our customers for superior performance and overall excellence in precision manufacturing. Our entire organization is proud of the acknowledgement, and proud of our continuing company-wide commitment to outstanding quality and customer service. Our most recent achievements include: Boeing Excellence Awards for 2013, 2014, 2015 & 2016. Recognition by some of the top defense and aerospace firms in the world is a testament to our culture of excellence that began in 1958, when Andrew Watson began machining parts in a shed in Gardena, California. Since that time, Watson’s Profiling has grown into a precision manufacturing powerhouse, with state-of-the-art facilities and some of the best craftsmen in the business. At Watson’s, we will continue to provide the superior performance that has been at the foundation of our success for over fifty years. Experience our unsurpassed level of quality and service for yourself. Contact Watson’s Profiling today. In order to accomplish this, we maintain an extensive inventory of tooling and fixtures for quick set-ups on our modern CNC machine tools. Supporting this effort is a state-of-the-art CAD/CAM system with the ability to process digital product definitions in all major file formats, including Catia. We also maintain close working relationships with our raw material and processing suppliers so your time-critical order receives priority treatment. Put these tools in the hands of our committed team of manufacturing professionals, and you can see why we’re known in the industry as the “go-to guys” when it comes to quick-turnaround, reliable deliveries. When you need your order shipped yesterday, you need the team at Watson’s Profiling. Watson’s Profiling maintains thousands of completed parts and assemblies in stock and available to ship at a moment’s notice for quick delivery requirements; and to support our Just-In-Time and other long-term purchasing agreements. All of our stock items have complete traceability to associated purchase orders, test reports and certifications, and are maintained in pristine condition. Our extensive stock of parts is yet another way in which Watson’s Profiling supports our customers’ current and future needs with exceptional service and reliability. If we’ve built something for you in the past, chances are we’ll have some stock parts and assemblies when you need them. Contact Watson’s Profiling to find out more about our stock parts and availability. 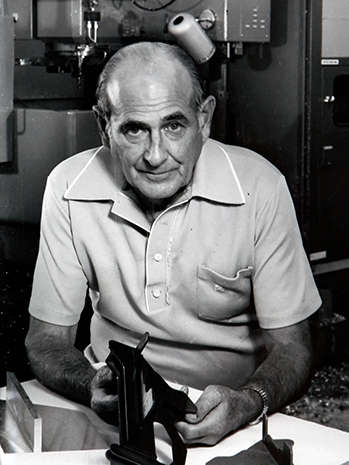 In 1958, when Andrew Watson started machining precision components for the burgeoning Southern California aerospace industry, his simple combination of quality workmanship and exceptional customer service was a recipe for success. Since that time, the small shop that started in a shed in Gardena, California, has grown exponentially; yet Andrew would still recognize his fundamental principles at work in the company today. "A solid reputation for uncompromising quality, extraordinary customer service, and quick, dependable deliveries." Now, more than fifty years later, Watson’s Profiling Corporation is a manufacturing powerhouse specializing in small-to-medium sized, precision-machined parts and assemblies using a variety of materials from aluminum and plastics, to stainless steel, titanium, and more. Our 13,000-square-foot modern manufacturing facility in Ontario, California, is certified to ISO 9001:2015 and AS9100D; and approved to BQMS D6-82479 by The Boeing Company. With state-of-the-art, American-made machine tools, the latest CAD/CAM technology, and a talented team of professionals and craftsmen, Watson’s Profiling has the precision machining versatility and know-how you need to compete in today’s global marketplace. Over the years, Watson’s Profiling has built a solid reputation for uncompromising quality, extraordinary customer service, and quick, dependable deliveries. Our customers have recognized our performance and dedication to excellence with a range of prestigious awards including: Boeing Excellence Awards for 2013, 2014, 2015 & 2016. Our entire team is proud to be included among the top-performing precision manufacturers in the industry today, and we are committed to remaining at the forefront when it comes to quality and value in precision machining and assemblies. Whether you need prototypes, short- or long-run production, or assistance with research and development projects, Watson’s Profiling has the manufacturing capacity and a dedicated team with the experience and knowledge you need to succeed in the 21st century. Contact us to learn more about the products and services available today at Watson’s Profiling Corporation. The experience and knowledge you need to succeed.